You could call Chris Banner’s love of Batman a true passion. Well, it’s actually more of an obsession. From the boots to the bat-cave and a custom-built Batmobile, Banner has made his being Batman his third job. 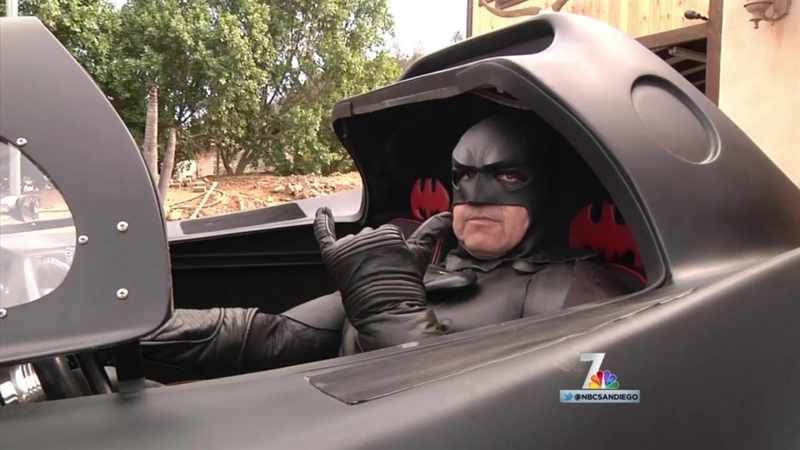 He even patrols his hometown of Valley Center, San Diego, as the Caped Crusader. His ride, he built from scratch, stripping down a 1947 Ford Galaxy and rearranging its engine and radiator. The work took about a year to complete, and it includes a camera to help him back up, a custom-made dashboard, lights and a smoke machine. “It's all made of fiber glass,” Banner told NBC 7 Wednesday. “It’s 22-feet long, and it’s one heck of a machine to drive, especially when you're Batman." The batty fanatic started collecting his favorite superhero’s gear after he got his first Robin costume at age 7. Now, he's turned his love toward a good cause. He produces live Batman shows about 40 times a year, sometimes for the Make-A-Wish Foundation. “You know some of these kids only have so much time left, and to put a smile on their face, it makes them happy. It’s worth it to me,” he said. “Makes that whole day better so hopefully I got to a good place." When he takes off the mask, it’s no Bruce Wayne-style existence for Banner. He instead works in real-estate and weed trimming, for which he uses the bat-themed tractors. But to neighbors and students, he’ll always be a silent guardian, a watchful protector, a dark knight: the North County Batman. “I've gone into their classrooms and stuff, and I think I make a positive reaction and hopefully help them out in life and teach them to be good kids,” Banner said. “There's a lot of troubled kids out there, so keeping them safe and on the right path."